In 1991, Satyam Computer Services Ltd set up “Little India" in a town of about 45,000 people in the heart of the US Midwest. This foothold was about as far removed as possible from Satyam’s headquarters in Hyderabad, but it was the home of the four-year-old company’s first Fortune 500 client. From a rented house across from the customer’s software-development centre, 10 Satyam engineers field-tested the benefits of global IT offshoring by pretending they were in India. They worked nights to simulate the time difference and for six months never met their customers across the street in person, communicating only through a dedicated satellite link. 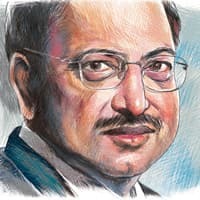 “In the end, the team performed better from Little India than they had while working on site," Satyam’s founder and chairman, Ramalinga Raju, says today. “It was a great success." Now Raju is engaged in another test: fine-tuning a business model designed to deliver uniform client experiences while keeping everyone in the company focused on the same objectives, despite phenomenal growth. For a stable company, such an initiative would be difficult enough, but Satyam’s revenues have grown at a compound annual rate of more than 50% over the past decade. And the pace can’t let up if the firm hopes to achieve its aspiration of becoming one of the top providers of consulting, IT, and business-process-outsourcing services in the world by 2010. Raju says the development of an innovative business model early on played a vital role in the company’s success. Among other benefits, the framework helped sustain an entrepreneurial spirit, distributed leadership roles throughout the organization and created an environment focused on “delighting" stakeholders. What made you start thinking about a new business model? My educational background is not in technology but in commerce and business administration. Before I explored the IT sector, I dabbled for about a decade in manufacturing, construction, infrastructure, agriculture and imports and exports, among other businesses. So, in the initial years, when my brother, a few colleagues and I evaluated opportunities in the emerging knowledge industry, we looked at things from a different perspective. Still, we saw more commonalities than differences among all these sectors. However, the knowledge industry operates in a dynamic environment and, in our view, it required a more refined and sophisticated business model to suit the times and the industry. For example, in the knowledge industry there is a greater coupling between strategy, operations, and stakeholder intimacy than demanded by traditional industries. To bring this all into focus, we came up with our “TDC" model, which stands for “thinking", representing strategy and innovation; “doing", operational excellence; and “communicating", connecting intimately with stakeholders. It’s not rocket science, but when you look at a company like ours, you see that traditionally most of the thinking and communicating is done at the top, and most of the doing at the bottom. In the SatyamWay we expect leaders throughout our organization and at all levels to strike a balance among these three value- creating tasks. What are some of the other differences you identified? We also recognized that traditional hierarchical models will not be effective in a knowledge industry. Rather than focusing the whole business on delivering value in one way. At Satyam value was being delivered in many different ways, depending on the services our clients needed. To cater to these differences, we created an organizational design that distributed leadership more uniformly. Ownership of results shifted to leaders who were closest to the relevant stakeholders, which could be their colleagues, investors, clients, or even society... The rest of the organization supported these leaders from behind the scenes, helping to create a “One-Satyam" experience for the stakeholder. This design also sought to bring the correct balance between building the right soft assets that have lasting value and delivering reliable results for stakeholders. I am glad to report that we have done consistently well on all fronts. From the perspective of our associates, we were rated as the second best employer across industries in a survey by Hewitt India and The Economic Times. From an investor’s viewpoint, $1,000 (Rs39,900) in 1992, when we went public, would have yielded $1 million by 2007. We enjoy one of the highest levels of customer satisfaction in the industry. On top of all this, we are consistently rated as one of the most socially responsible organizations in the country. What is the most distinctive aspect of the business model that you have adopted? The recognition that value creation follows a similar structure irrespective of industry, type of function, or level within an organization. For that matter, philanthropic undertakings also reflect the same value-creating structure. In that sense, it is analogous to fractals in science and mathematics. Not to get too esoteric; fractals are self-replicating constructs that become increasingly small, like the sections of a seashell or the buds in a stalk of broccoli. While they are similar, they are not necessarily identical. You can look at a business in the same way and try to find a pattern for value creation, an essential DNA that repeats itself in every area and at every level. So, we started looking for the smallest reasonable construct in our business that repeats itself. This construct had to deliver value to someone—a client, an internal customer, some other stakeholder—but it also had to be large enough to stand alone. In our model, we brought it down to what we call the full life cycle business. The formal definition is a group that takes full responsibility for creating value from a certain set of activities. This could be, for example, relationship management with a particular client or campus recruitment. The essential way these businesses operate, their DNA, is the same. Simply stated, whatever the nature of the activity, our model tries to balance maintaining the precepts of the TDC model, creating assets that deliver consistent results and contribute to future value, and satisfying stakeholder interests. Altogether we’ve recognized about 2,000 full life cycle businesses, each similar to one another in the way they create value. Doesn’t such a large number of full life cycle businesses fragment the organization? No, on the contrary, it unifies things for the benefit of each stakeholder... Each full life cycle business has a leader, and the principle behind distributed leadership is to empower leaders at every stakeholder touch point. At that “moment of truth", the leader is the centre of the universe. Delivering the One-Satyam experience by aligning the organization to delight the customer becomes the prevailing operating principle. Then, in addition, a formal system of metrics acts as the glue holding it all together. Let me give you an example. Our organization has 40,000 people today and at the end of the fiscal year we’ll probably have more than 55,000. Many of the people we bring in will be straight out of college. Human resources are broken down into three elements: attraction, retention and management. Attraction is all about recruitment: You recruit on campus, within the industry, outside the industry, and so forth. Each of these components becomes a business. Each of these businesses has its own set of benchmarks to match or exceed and stakeholders to delight. Also, these businesses may be pulled together at an integrated full life cycle business level for a common goal. It’s much like a movie producer bringing together the director, the actors, the screenwriters, the caterers, the marketers, et cetera, for a film and then releasing them once the project is completed. This allows us to assemble and reassemble as needed. It also creates a strong platform for performance management and leadership development—critical areas when you are growing as fast as we are. This is the first of a two-part interview. The rest of the interview will appear on Tuesday. —Prashant Gandhi is a principal in McKinsey’s New Delhi office, and Joydeep Sengupta is a director in the Mumbai office. This article was published as a Web Exclusive in September 2007 and can be found on The McKinsey Quarterly website, www.mckinseyquarterly.com. Copyright © 2007 McKinsey & Company. All rights reserved. Reprinted by permission.